Stressed Americans are increasingly turning to adult coloring books to dull the pain of everyday life, and plenty of fandoms are cashing in on the trend. 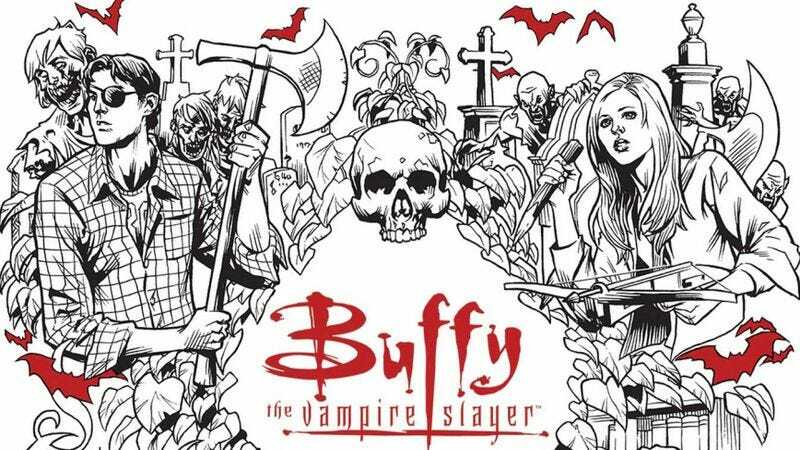 Fans of Buffy The Vampire Slayer will soon be able escape to a 2-D Sunnydale: According to Entertainment Weekly, in addition to upcoming coloring books for Serenity and Avatar: The Last Airbender, Dark Horse Books will be releasing an adult coloring book for the Buffyverse. The book will include 45 detailed original illustrations of characters and moments pulled from the entire series, including pages dedicated to the entire Scooby Gang as well as villains like The Master, Glory, The Trio, and, most importantly, Drusilla. The illustrations were drawn by some of the comic book artists for seasons eight, nine, and 10 of Buffy, including Karl Moline, Rebekah Isaacs, Georges Jeanty, Yishan Li, Steve Morris, and Newsha Ghasemi. With them, you can add some much-needed color to the very dark world of Buffy Summers, but remember: This is an adult coloring book, so take it extremely seriously. This is high-stakes coloring. There is no room for error. The Buffy coloring book is now available for pre-order and will be released on January 17, 2017.